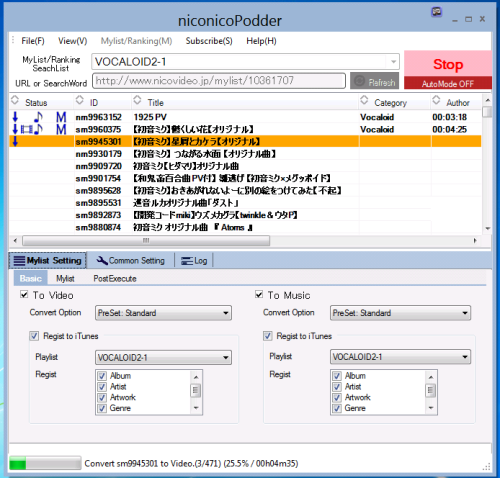 niconicoPodder is a most easy Import Tool from niconicoDOUGA(niconico) for iPod/iPhone/iPad. The Movies registered in a Mylist/Ranking/Search Results of NicoNicoDouga can import to iPod/iPhone/iPad by full automation, and it registers in an playlist you want of iTunes. Possible to correspond to all kinds of iPod/iPhone because it corresponds to both the video conversion and the music conversion. The operation only pushes "Start" button specifying URL of a Mylist or Keyword of Search. A difficult parameter and it is not necessary to set it (It is possible to set it). It is the best for "Very if it is necessary to study the Videos conversion or to combine various tools though I want to enjoy NicoNicoDouga with iPod and iPhone and iPad". Only push button, easy import. You don't need difficult knowledge, You just push 'Start' button, niconicoPodder import all videos and musics to your iPod/iPhone/iPad automatically. Import Ranking and Seach Result. You can also import niconico Ranking and Search Result what you want. Of course, You jsut push 'Start' button. niconicoPodder drive automatically. If you specifies MyList/Ranking/Search Result, niconicoPodder import in order instead of you. Your iPod/iPhone/iPad is always maintained at the newest. A Subscription fee for a full function is JPY 525 per month. Paypal can be used for the payment of a subscription. Please apply for the subscription from [subscription]menu-[the application for the subscription] of niconicoPodder. Moreover, please look over [subscription]menu-[help] before you subscribe. Please download one corresponding to OS that you are using. In many cases, you may 32bit version. * Please install from installer. SWFConvert is an external command to convert the SWF file offered by the GPLv2 license in videos. It uses it with niconicoPodder. The source code has been opened to the public based on the GPLv2 license regulations. Microsoft .NET Framework 4.0 or newer is necessary.It doesn't correspond to NET Framework 2.0 or older. When starting, it becomes an error when NET Framework 4.0 is not installed. In that case, please install it on 4.0 distribution page or from Windows Update. Theoretical corresponds to Windows Vista/7/8/8.1/10. However, the author conformed in Windows10 Pro(64bit/32bit). Recommends iTunes21 or newer. The author confirmed only since this version. However, I recommend a most newer version. Most easy way, Input Mylist's URL or Search Keyword in [MyList's URL or Keyword] Field and Push [Refresh]Button. List will display MyList's List or Search Result List. Then push [Start]Button, Import to iTunes starts in order automatically. Select [MyList/Ranking]Menu - [Import Ranking], You can import Ranking List.Please select Target/Period/Category in DialogBox. It is the same as the case of MyList after that. Converts it into MP4(video) file or MP3(music) file with the folder conversion ahead after FLV or MP4 and the SWF file are downloaded when [Convert to Video ] or [ Convert to Music ] is checked. Moreover, it registers to the playlist for which iTunes specified the converted the video and the music file by checking [Register to iTunes]. If you set ON the [Auto Mode]Button, Start 'Auto Mode'. It imports automatically in order by changing MyList/Ranking/SearchList registered in order. This is a very convenient function "which is imported freely and changed into the newest state even if it lets things go."! URL of NicoNicoDouga has been described in the first line of the property information tag comment of the file registered in iTunes as follows. It must use when registering to iTunes in the system, and neither deletion nor I must change. The troubles such as not doing registration to iTunes when the deletion and the change, done and doing doubly occur, etc. When you use niconicoPodder, it is assumed to the following software licensing agreements the agreed one. Please refrain from use when it is not possible to agree.